Beautiful certificate from the J.I. 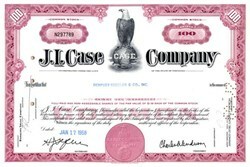 Case Company issued in 1968. This historic document was printed by the Security-Columbian Banknote Company and has an ornate border around it with a vignette of Old Abe the eagle. This item has the printed signatures of the Company’s President, and Secretary, and is over 44 years old. Case evolved as World War II arrived, becoming involved in the manufacturing of shells for the United States and allied forces military, as well as airplane parts for the B-26s, and bombs. Three new plants were opened across the United States during that year, and, in 1942, the company produced its first self-propelled combine – a Model 123 SP harvester. That same year, Case released the company's first cotton picker, which is currently preserved by the Smithsonian society. Old Abe (1861? – March 28, 1881), a female bald eagle, was the mascot of the 8th Wisconsin Volunteer Infantry Regiment in the American Civil War and is the screaming eagle mascot depicted on the insignia of the U.S. Army's 101st Airborne Division. Old Abe was also the trademark eagle on the globe of the Case tractor company.